Treat yourself to this easy to make green smoothie that packs plenty of nutrition. If you’re new to green smoothies, this is a good one to start with. If you’re a smoothie veteran, start with the basic version of this recipe and get creative with the add-ons to build your own nutrient dense tasty green treat. The ingredients in this smoothie offer much in the way of nutrition. Let’s first explore what pear can do for you. Pears are high in fiber, vitamin C, and vitamin K. The latter two nutrients along with copper help squash free radicals via their antioxidant properties. 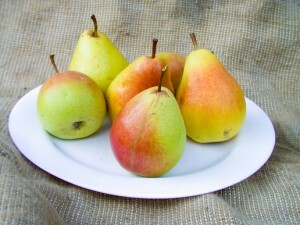 The fiber found in pears supports cardiovascular and colon health. Pears are also Hypo-Allergenic. Ginger is well known for aiding digestive issues, such as heartburn, nausea and vomiting, especially in pregnant women. As a potent anti-inflammatory, ginger can help reduce pain caused by inflammation. Ginger also boosts the immune system, helping prevent and eliminate a cold or flu, protects against certain cancers, and offers relief for migraine sufferers. Good old baby spinach is my favorite green smoothie veggie because it’s so easy to blend and doesn’t overpower the taste of my smoothie like some bitter greens. Spinach is loaded with phytonutrients that offer the following health benefits: anti-inflammatory, antioxidant, anti-cancer, helps build strong bones, and is good for digestion. Flax seeds are a good source of the all important omega-3 essential fatty acids, which are vital for a healthy cardiovascular system. Flax seeds are high in fiber, thus support good digestive health. They also provide anti-inflammatory, antioxidant, and anti-cancer benefits. These four ingredients along with a little organic honey make this one healthy smoothie. Enjoy! Any superfood you desire – such as cacao, maca, bee pollen, or spirulina. Please leave a comment below if you try this ginger pear green smoothie. Happy Blending! Another favorite! I made this today, adding in strawberries and 1/3 c frozen navy beans. Instead of honey, I used a little chunk of frozen banana to sweeten. Very satisfying, and I’m proud to say, my version adds up to 10 grams of protein (with an adequate balance of the amino acids, no less!). Thank you Ryan. You’re inspiring me to go back and make recipes I haven’t in a while. Frozen navy beans – I’ve never thought to add something like that into a smoothie. My paradigm is shifting :) Elated to hear you’re making and enjoying so many of my recipes. Just made my own variation of this; didn’t have flax seeds on hand, so I added a 1/2 of a banana (suggestion taken from Niko for sweetener instead of the honey), the apple, and about half a cup of ice to thicken it up a bit. It is DELICIOUS!!!! I’m a huge ginger fan, so this will become a staple smoothie of mine. :-) Thanks for posting! Love the green smoothies! Thanks for sharing your version of this recipe. A staple smoothie is music to my ears :) Love hearing that you used another commentators (Niko) suggestion. Sharing smoothie tips and ideas is what it’s all about. I don’t have fresh ginger on hand, would dried work? Besides water, would almond milk or coconut water be ok? Sure, almond milk, coconut water and milk, raw milk, and tea are all good options. Is it ever better to use water over the others? I just thought the added nutrients would be better. The liquid you use is more a matter of preference than anything. Milks and tea will add additional nutrition. I like to switch it up myself. I was looking for another recipe to get more ginger to help work through a lung infection – this felt like just the right thing and was the tastiest food I have enjoyed in a week. The version I tried – pear, squeezed in a lemon, ginger, coconut oil, I tsp of bee pollen, green tea I had left over and a green apple. Thank you for the ideas you share in newsletters and I enjoy visiting your website to look for new ideas and nutritional information! “Tastiest food I have enjoyed in a week” might be the top smoothie testimonial I’ve received to date :) You’re version sounds delicious – especially the addition of a green apple. Always nice to hear when someone is enjoying my newsletter and website content – you’re welcome! Thank you for a delicious banana-free smoothie! I added half a cup of blueberries and swapped the honey for maple syrup to make it vegan. Super delicious! You’re welcome, Cherie! I like the blueberry addition and maple syrup for honey. Made this with the one substitution of beet greens instead of spinach — was a little worried that the pear would be too gritty for a good smoothie — but this turned out great! Will make it again tomorrow. Thank you. Thanks for sharing your modification to this recipe and nice to hear you enjoyed it!